Novas Energy USA Inc., (Novas) is pleased to announce that it has opened new offices in the heart of the oil industry in order to introduce its proprietary Enhanced Oil Recovery (EOR) technology to North America. Novas is headquartered at 1701 Commerce Street, Second Floor, Houston, Texas 77002. John W. Huemoeller II, Novas Energy USA’s CEO said, “With the world’s Oil and Gas reserves diminishing and the costs of extraction on the rise, the need for new Enhanced Oil Recovery techniques are becoming paramount." Novas is engaged in the commercial application of a proprietary "Plasma-Pulse Technology" (PPT) to enhance the recovery of oil and gas. The patented science underpinning the device and treatment uses a refractory, electro-magnetic pulse, of relatively low power to propagate into the formation reservoirs. 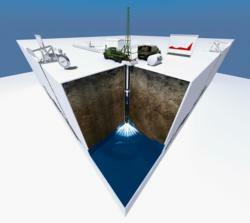 The result allows for more oil to flow and reduces water cut substantially. Research and Development of the patented and proprietary technology began in 2002 and took five years to perfect. Top scientists, geologists and engineers were consulted on the project and the prestigious Skolkovo Foundation provided a $1 million grant for the proof of concept. After millions more of investment, the technology has now been tried and tested on almost 200 wells in various parts of the world. Extrapolated data supports efficacy across a wide range of well characteristics with over an 80% success in achieving 50% or more improvement in existing well production. The U.S. target market has tremendous potential since it is estimated that 87% of the known oil reserves in the United States remain abundant in the ground. By optimizing production efficiency, well enhancement and Enhanced Oil Recovery the PPT can extend the economic life of mature oil fields by several decades, creating more jobs and boosting industry profits. John W. Huemoeller II, Novas Energy USA’s CEO said, “With the world’s Oil and Gas reserves diminishing and the costs of extraction on the rise, the need for new Enhanced Oil Recovery techniques are becoming paramount. This technological breakthrough could mean literally billions of dollars in savings for both the oil industry and consumers in the United States." About Novas Energy USA Inc. The Skolkovo Foundation is a non-profit organization that aims to accelerate the transformation of Russia into an innovation-powered economy through strategic partnerships with leading scientists and innovators at more than 700 companies and startups. Founded in May 2010 by the Russian government, the Foundation strives to strengthen the link between Russia and international science, technology, education, entrepreneurial and investment communities through the development of the Skolkovo Innovation Centre, which will establish a vibrant ecosystem of technological innovation and entrepreneurship. For more information, visit http://www.sk.ru/en/.